Don Cherry has become a broadcasting legend, garnering millions of fans around the world with his "Coach's Corner" segment on Hockey Night in Canada. For over a decade, Cherry also hosted the TV show Grapevine, which brought viewers up close and personal with the biggest names in sports. Don was the interviewer and his son, Tim, produced the show. And no one in the sports world, from hockey players to boxers to curlers to umpires, turned down an invitation to appear on it. It was on that show that Don has some of his fondest memories from his many years in the biz, and, at last, in Don Cherry's Sports Heroes, he gives us behind-the-scenes access to some of his most fascinating and revealing interviews with the all-time greats. Don has his signature candidness and sizzling humour in these interviews and stories. In these pages you'll find epic stories about hockey greats Maurice "Rocket" Richard, Wayne Gretzky, Bobby Orr and Gordie Howe, to name a few, and since Grapevine TV was the place to be in the sports world, you can revel in some unforgettable stories on players in other fields, too. Don Cherry shares with the world tales that only a true insider could know. You won't be disappointed. 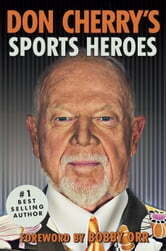 Don Cherry is a character and it is an enjoyable read!